This post was created in partnership with Bed Bath & Beyond but all opinions are my own! Count down is on guys! Just a couple of weeks away from Christmas and I finally managed to start on my shopping list and the house is beginning to feel and look a bit more festive! Living in a townhouse with limited storage, I’m always reluctant to buy more seasonable decor. But during my visit to Bed Bath & Beyond over the weekend, I just couldn’t refrain from picking up a few of my favourite things! I don’t typically decorate our bedroom with holiday trimmings but I was smitten by all the Cozy Shop mix and match options and ended up bringing home a few items that I am convinced we will be using throughout the winter season. 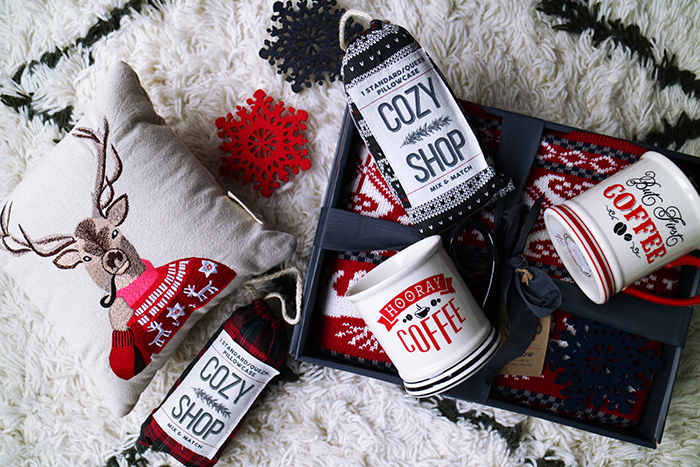 Keep reading to see the holiday goodies I brought home from Bed Bath & Beyond! 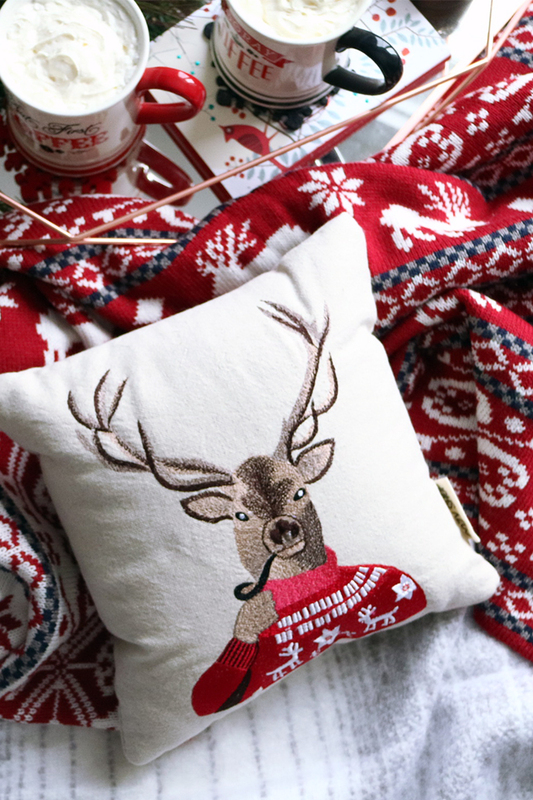 I first laid my eyes on this adorable reindeer with pipe pillow. Don’t you think it’s such a fun twist to a classic Christmas icon? With a few seconds of contemplating, I decided that this pillow was a MUST and not a nice to have and began to imagine how I’d like us to spend Christmas morning in bed. Without investing in a full bedding set, I found a collection of Cozy Shop Mix & Match pillow cases, exclusively available at Bed Bath & Beyond and knew they were just the perfect little addition. There are a variety of classic and cute Christmas themed prints and they even come in little pouches that make them ideal as stocking stuffers. To save on purchasing a new duvet cover or comforter set, I was in luck to find these boxed throws that were on special for $19.99! The red reversible fair isle moose knit throw was exactly what I was looking for in terms of injecting a lively touch of Christmas spirit. But I also bought this incredibly soft reversible striped ombre mohair version to layer underneath. It’s a fabulous way to add some extra texture and warmth without having to make a hefting investment. These boxed throws are great as gifts and I’m positive that I’ll be bringing them down to the living room to be used cozying up on the couch! 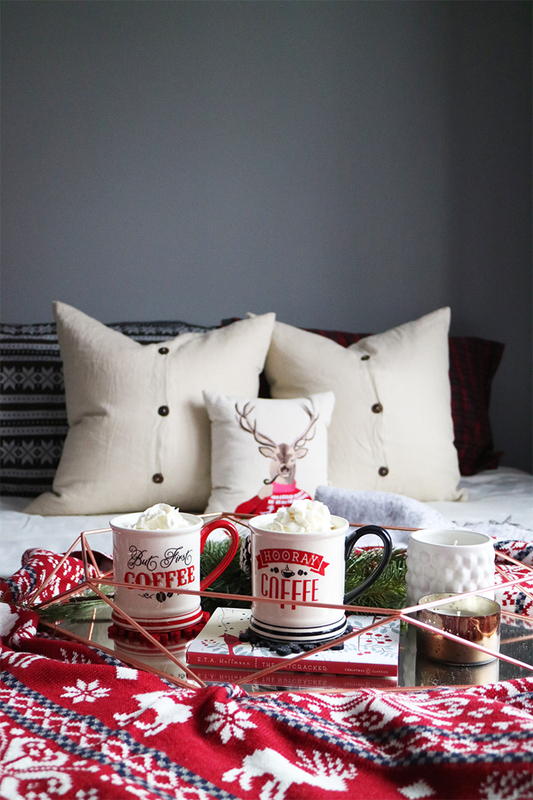 And when it comes to Christmas morning, nothing beats starting the day off with a freshly brewed cup of coffee topped with whipped cream in bed! 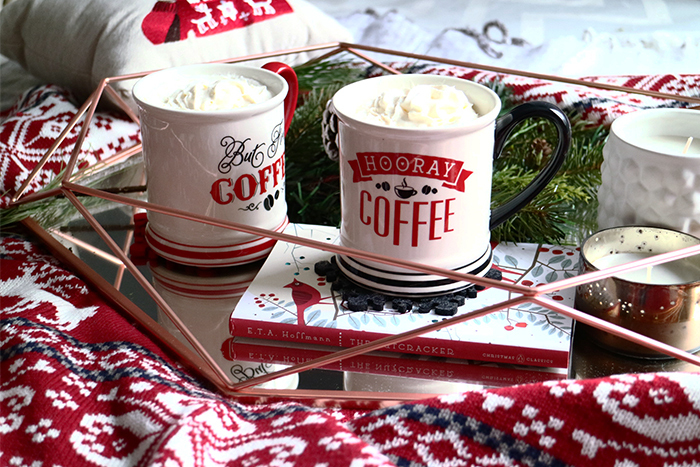 I absolutely love these coffee mugs (here and here) and snowflake coasters I found that will definitely find a permanent spot in the kitchen cupboard. 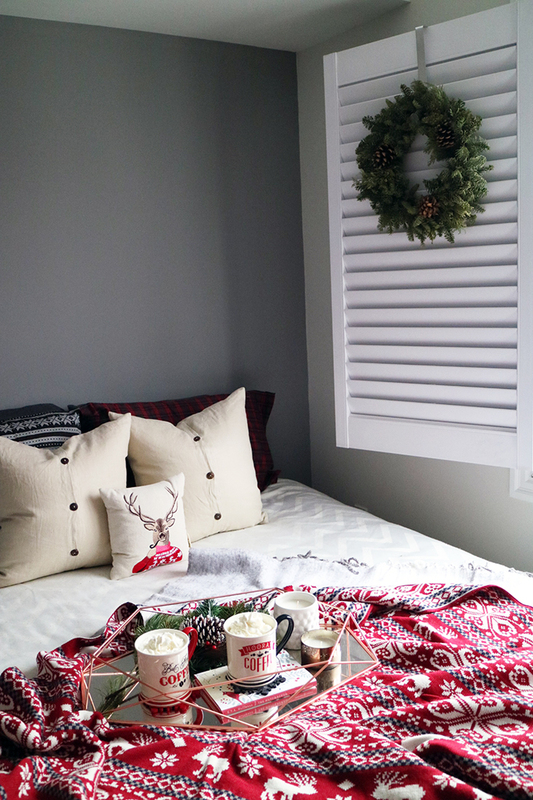 With a few extra decorative touches such as scented candles and the fresh smell of pine, my Christmas Holiday Bedding is ready to be enjoyed over the entire Christmas break! I’m not sure about you, but my feet get really chilly during the winter months and I’ve often placed a heated neck warmer at the foot of the bed to ensure that my feet get extra toasty! 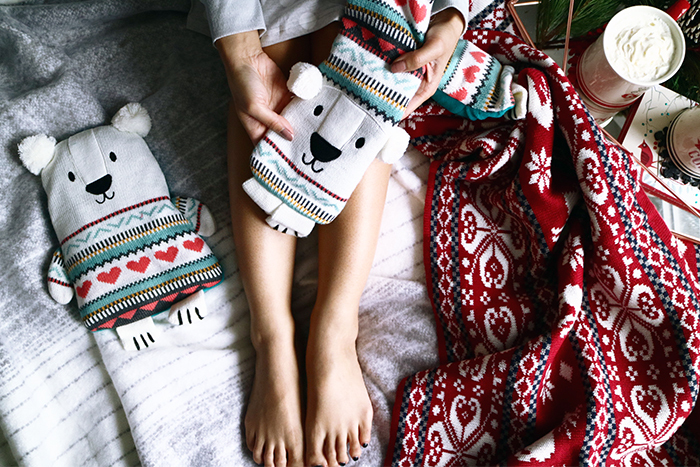 I stumbled upon Aroma Home’s collection of microwavable Cozy Critter Hot/Cold Neck Warmers and Cuddle Hotties! They were WAY TOO CUTE to pass up and I ended up buying a couple for myself and a few for my nieces too. They also come in different animals! And of course, aside from bedding goods, Bed Bath & Beyond also carries a massive selection of holiday home items, gifts, and all your baking needs. To prepare for a Cookie Exchange party I have been invited to next week, I picked up all my baking goods. 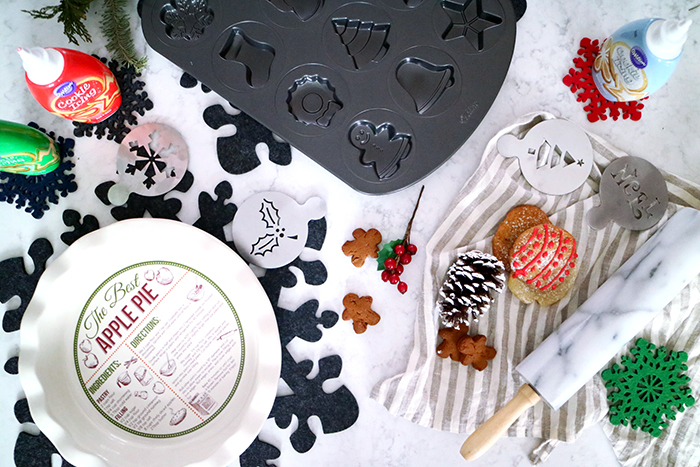 The Wilton 12-Cavity Holiday Cookie Shapes Pan is definitely going to my Christmas lil’ helper! Aside from putting up a Christmas Tree and lights, what updates do you make to your home to make it extra special for the holidays? If you’re looking for more gifting or home decorating ideas for Christmas, check out the Bed Bath & Beyond online holiday catalog for many great finds! WoW, Wonderful Post. I like your Christmas bed decoration tips and ideas. This is very Unique designs feel so good. I am full of inspiring now. I am trying to follow your technique.